For comparative studies, see Christianity and Islam. Christian influences in Islam could be traced back to the Eastern Christianity, which surrounded the origins of Islam. Christians also introduced the Muslims to Greek learning. Eastern Christians (particularly Nestorian Christians) contributed to the Arab Islamic Civilization during the Ummayad and the Abbasid periods by translating works of Greek philosophers to Syriac and afterwards to Arabic. They also excelled in philosophy, science, theology and medicine. The majority of Muslim countries also use a Gregorian calendar and some countries observes Sunday as a non-working day. In the late 7th and 8th centuries, Muslims encountered Levantine Christians. The cognate Syriac word sahedo may have influenced the Arabic shahid (martyr-witness). 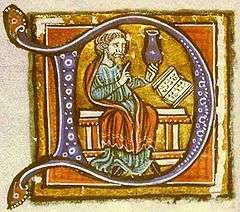 During the Abbasid dynasty, translations of the gospels from Syriac into Arabic were made, particularly by historian Bar-Hebraeus, at the request of the Arab governor. Hagia Sophia, an Eastern Orthodox church converted into a mosque after the Fall of Constantinople; in 1935 it was converted into a museum, following a decision by Kemal Atatürk. Roman and Byzantine styles were particularly prevalent in early Islamic architecture. One of the examples is the Dome of the Rock (late 7th century) in Jerusalem. Its design is derived from Roman architecture. Madrasa-Mausoleum of Sultan Al Nasir Muhammad in Cairo has a Gothic doorway from Acre, reused as a trophy. The former Christian cathedral Madrasat al-Halawiyya in Aleppo, probably taken by Nur ad-Din Zangi, featured an altar. The Aqsa Mosque has a sculpted ornament, taken from Crusader structures of the 12th century, in the arches of the facade. The upper double capital of the mosque on twisted columns expresses the unity of nature in a characteristic Romanesque style. After the fall of Constantinople, the Ottomans converted a major basilica, Hagia Sophia, to a mosque and incorporated Byzantine architectural elements into their own work, such as domes. This was a part of the conversion of non-Muslim places of worship into mosques. The Hagia Sophia also served as model for many Ottoman mosques, such as the Shehzadeh Mosque, the Suleiman Mosque and the Rüstem Pasha Mosque. Christological motifs could be found in the works of Nizami, Rumi and others. Islamic artists applied Christian patterns for iconography. The picture of the birth of Muhammad in Rashid ad-Din's Jami at-Tarawikh is reminiscent of the birth of Jesus. The angels, hovering over the mother, correspond to a Christian type, while the three women, who came to visit the mother, conform to the three Biblical Magi. Some surviving Ayyubid inlaid brasses feature Gospel scenes and images of Madonna with infant Jesus. References to the Annunciation and the baptism of Jesus are manifest in al-Athar al-Baqiyah, where the Virgin is depicted in accordance with her representation in Byzantine art. The frescoes of Samarra, painted between 836 and 883, also suggest the Christian craft because of the Christian priests who are the subjects and the signatures of the artist. luminure from the Hunayn ibn-Ishaq al-'Ibadi manuscript of the Isagoge. Hunayn ibn-Ishaq a famous and influential scholar, physician, and scientist of Assyrian Christian descent. Christians (particularly Nestorian Christians) contributed to the Arab Islamic Civilization during the Ummayad and the Abbasid periods by translating works of Greek philosophers to Syriac and afterwards to Arabic. During the 4th through the 7th centuries, scholarly work in the Syriac and Greek languages was either newly initiated, or carried on from the Hellenistic period. Centers of learning and of transmission of classical wisdom included colleges such as the School of Nisibis, and later the School of Edessa, and the renowned hospital and medical academy of Jundishapur; libraries included the Library of Alexandria and the Imperial Library of Constantinople; other centers of translation and learning functioned at Merv, Salonika, Nishapur and Ctesiphon, situated just south of what later became Baghdad. The House of Wisdom was a library, translation institute, and academy established in Abbasid-era Baghdad, Iraq. Nestorians played a prominent role in the formation of Arab culture, with the Jundishapur school being prominent in the late Sassanid, Umayyad and early Abbasid periods. Notably, eight generations of the Nestorian Bukhtishu family served as private doctors to caliphs and sultans between the 8th and 11th centuries. The one valuable item, sought for in Europe, which Iran possessed and which could bring in silver in sufficient quantities was silk, which was produced in the northern provinces, along the Caspian coastline. The trade of this product was done by Persians to begin with, but during the 17th century the Christian Armenians became increasingly vital in the trade of this merchandise, as middlemen. Immediately after the Conquest of Constantinople, Mehmet II deported all the Christian population of the City, leaving only the Jewish inhabitants of Balat. Afterward, he repopulated the city bringing inhabitants - both Christian and Muslim - from the whole empire and from the newly conquered territories. Phanar was then repopulated with Greeks deported from Mouchlion in the Peloponnese and, after 1461, with citizens of Trebizond. The roots of Greek ascendancy can be traced to the need of the Ottomans for skilled and educated negotiators as the power of their empire declined and they were compelled to rely on treaties more than the force of arms. From the 17th century onwards the Ottomans began facing problems in the conduct of their foreign relations, and were having difficulties in dictating terms to their neighbours; the Porte was faced for the first time with the need of participating in diplomatic negotiations. Given the Ottoman tradition of generally ignoring Western European languages and cultures, officials found themselves unable to handle such affairs. The Porte subsequently assigned those tasks to the Greeks who had a long mercantile and educational tradition and could provide the necessary skills. As a result, the so−called Phanariotes, Greek and Hellenized families mostly native to Constantinople, came to occupy high posts of secretaries and interpreters to Ottoman officials and officers. Some of the most influential Arab nationalists were Arab Christians, like George Habash, founder of the Popular Front for the Liberation of Palestine, and Syrian intellectual Constantin Zureiq. Many Palestinian Christians were also active in the formation and governing of the Palestinian National Authority since 1992. The suicide bomber Jules Jammal, a Syrian military officer who blew himself up while ramming a French ship, was also an Arab Christian. While Lebanese Maronite Christian were among the Masters and Fathers of the Arabic Renaissance Al-Nahda. Today Middle Eastern Christians are relatively wealthy, well educated, and politically moderate, as they have today an active role in various social, economical, sporting and political aspects in the Middle East. ↑ Brague, Rémi (2009-04-15). The Legend of the Middle Ages. p. 164. ISBN 9780226070803. Retrieved 11 Feb 2014. ↑ Pope to Arab Christians: Keep the Faith.